We have been EAGERLY awaiting the opening of Mr. C&apos;s in New Braunfels and as of 3/27/2019 it&apos;s finally open!!! 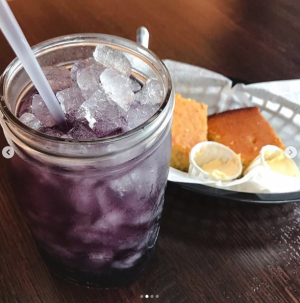 We popped in today with a lunch feast in mind just after they opened their doors and were greeted with cornbread, butter, and in a quick moment, the KoolAid we ordered! KOOLAID!! How retro and adorable is that? 90&apos;s summer vibes, OH YEAH! We admired the ambience of Mr. C&apos;s while sipping our KoolAid. It is casual and decorated in a mix of modern-industrial smooshed with hipster-country. After scanning the menu, we decided on fried green tomatoes (TAWANDA!!) and fried chicken skins as starters. The tomatoes were good. The chicken skin was cripsy and savory. It came with a brown dipping sauce, but some nice man came out from the back and brought us, unsolicited, a warm white gravy to try them in that was better. They were okay, not great, not bad, but okay. The chicken and waffles though... DAaaang!!! I could sing songs to those chicken wings! Tender, juicy, even without the ranch dipping sauce that 50% of our writing team can&apos;t live without. We chose Mr. C&apos;s Honey Hots. Six buffalo wings splashed with Mr. C&apos;s honey and hot sauce, with ranch to dip them in, served upside some soft fluffy waffles that were doused with a mini-lake of syrup (not pictured). Sweet, hot, creamy, savory, with a bit of a bright note from the vinegar-y hot sauce. It covered all the bases. 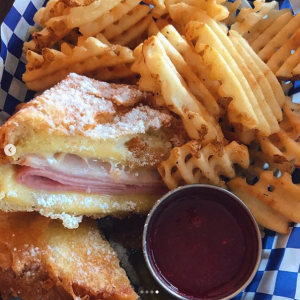 The other member of the team got a Monte Cristo Sandwich that was our absolute favorite from the meal! Turkey, grilled ham, and sweet melted Swiss cheese stuffed inside French toast that was crunchy, flaking a bit like a baklava, and dusted with powdered sugar to look like a beignet. What you end up with is sweet, savory heaven with a tangy raspberry dipping sauce taking it to the next level. Mr. C&apos;s is delicious. Classic southern foods presented in a new trendy way. Thoroughly enjoyed our meal there and are looking forward to coming back to try the raspberry-glazed pork chop. Take a pic and tag us @goodeatsnbtx on Instagram when you head there or find the next place we should try! Monday - Friday: 10:30 - 3:00 p.m.
Saturday & Sunday: 8:00 - 3:00 p.m.